Tracks A, B and D are able to use an ADSR Envelope to shape the amplitude of the sound. 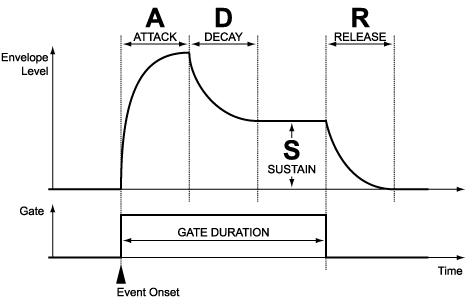 There's a handy diagram at the bottom of the page which might help if you're unsure of what an ADSR envelope does. Unlike pages such as Chain and Pattern Editor (and Instrument) where one object at a time is presented on screen, the ADSR List page is one of the pages that presents several objects in a list-form. This means that the numbers running down the left-hand side of the screen are the Envelope numbers that you specify in an Instrument or Command and that each row is an entire Envelope object made up of, in this case, four individual parameters. *1 The amplitude range of each of the NES's voices that have an amplitude setting is 00 to 0F, with 00 being silent and 0F being the maximum output volume. However, because Pulsar has a LEVEL parameter (set in Instruments or by the Output command, Oxx), the maximum amplitude that the ADSR is scaled by this setting and therefore may not necessarily be 0F. For Attack (AT), Decay (DC) and Release (RL), 01 is the slowest speed and FF is the fastest. The Sustain (SU) parameter range is 00 to 0F. If you specify 00 for the Attack (AT) parameter, the amplitude will start at maximum and at the Decay phase. If you speficy 00 for the Decay (DC) parameter, the Decay phase will be skipped and the amplitude will start at the Sustain Level. You can specify 00 for the Sustain Level. In this case the Envelope will effectively end after the Decay phase. If you specify 00 for the Release (RL) parameter, when the Gate Time ends or a note is Kill-ed (Kxx) the output will be silenced immediately. Shamelessly copied from a really great diagram on Audiomulch website. I included this as I thought it showed the relationship between all the parameters really clearly and in an understandable way.